I’ve been aware of tea tree oil for sometime. The only thing I ever used it on was a hang nail and I was amazed by the results. To be honest -I was turned off by the smell. Recently, I found some type of insect bites on my leg that I could not explain. They became large welts that were very sore to the touch, red, itchy and painful. I found some tea tree oil in the bathroom cabinet and thought I’d give it a try…lo and behold the welts are almost gone. It was time to do some research….I found this article – I have tried a number of these suggestions and am always impressed by the results. Tea tree oil, or melaleuca oil, is an essential oil that is taken from the leaves of the Melaleuca alternifolia, a plant native to Southeast Queensland and the Northeast coast of New South Wales, Australia. Tea tree oil has been used for centuries to treat a variety of common ailments, and there are many practical uses for tea tree oil in our everyday lives! 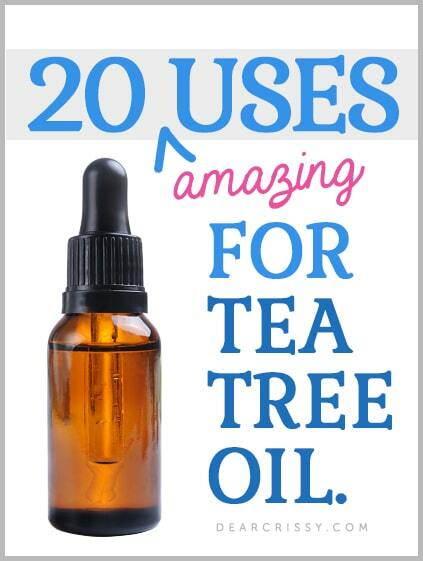 Keep reading to learn 20 uses for tea tree oil! 1. Acne —tea tree oil is a natural alternative for treating acne. Before use, it is a good idea to test your skin for sensitivity by applying a few drop onto the forearm or behind the ear. If you have irritation, it can be diluted with water. Apply morning and night to affected area and do not rinse. 2. Nail fungus — Paint tea tree oil full strength on the affected nail 2 times a day for a minimum of 2 months. The results are slow because the nail has to grow out to eliminate the fungus. 3. Insect repellent — Tea tree oil is known to repel mosquitoes, and this is one of my favorite uses for tea tree oil. In a large spray bottle add 2 ounces of tea tree oil and fill the rest with water shake well. Spray the solution onto a small area of the skin to check for irritation before applying to a large area. 4. Athletes foot cure — Apply a coating of tea tree oil to the affected area 2 to 3 times a day, when symptoms disappear, continue to apply for a couple of weeks to ensure fungus is cured. 5. Lice Prevention — Who knew that tea tree oil can be used to prevent lice? Mix a small amount of tea tree oil into your regular shampoo approximately, 10 to 12 drops. This is a really interested use for tea tree oil! 6. Skin tags — Apply tea tree oil to the skin tag and rub, repeat the process several times a day until the tag falls off on its own. 7. All purpose cleaner — Fill a spray bottle with 2 tsp. tea tree oil and the rest with water, this works great as an all purpose cleaner. 8. Ticks — Apply tea tree oil to the skin surrounding the tick, this will usually make the tick unlatch. 9. Wart remover — Apply a couple of drops of oil directly onto wart morning and night until the wart is gone. 10. Flea bites — Apply tea tree oil directly onto bite to help ease pain and itching. 11. Mosquito Bites — relieve itch by applying directly on to the mosquito bite. I’ve tried this and it’s one of my favorite uses for tea tree oil. 12. Ingrown hairs — Apply 1 to 2 drops to affected area every few hours until infection disappears. 13. Mold Killer — Use approximately 2 teaspoons tea tree oil mixed with 2 cups water and apply to mold. 14. Itchy scalp — Applying tea tree oil to the scalp will relieve the itch. 15. Dandruff — Pour a little tea tree oil into your regular shampoo to help control dandruff. 16. Headache — Add a few drops of tea tree oil to a warm damp cloth hold the cloth over face to inhale the vapors. 17. Treat a cold sore — Applying a little tea tree oil to cold sore several times a day can help reduce the severity and the duration of the outbreak. 18. Antiseptic — Apply directly to minor cuts and scrapes to help reduce the possibility of infection. 19. Joint and muscle pain — Mix tea tree oil with your favorite cream and rub onto painful areas. 20. Nasal congestion — Put a few drops of tea tree oil into the water of your humidifier, or boil a cup of water add a couple of drops of tea tree oil and inhale the vapors. So, those are a few of my new favorite uses for tea tree oil. Do you have a favorite way to use tea tree oil in your daily life? I would love to hear more in the comments! Tea Tree Oil, it’s A Wandaful Thing! This entry was posted in DIY and tagged DIY, easy, free, ideas, living, oil, simple, tea, tea tree oil, tree. Bookmark the permalink.